A cold front generated moderate falls in the South West Land Division of Western Australia at the start of the week. A complex low pressure system brought moderate falls to Tasmania at the end of the week. 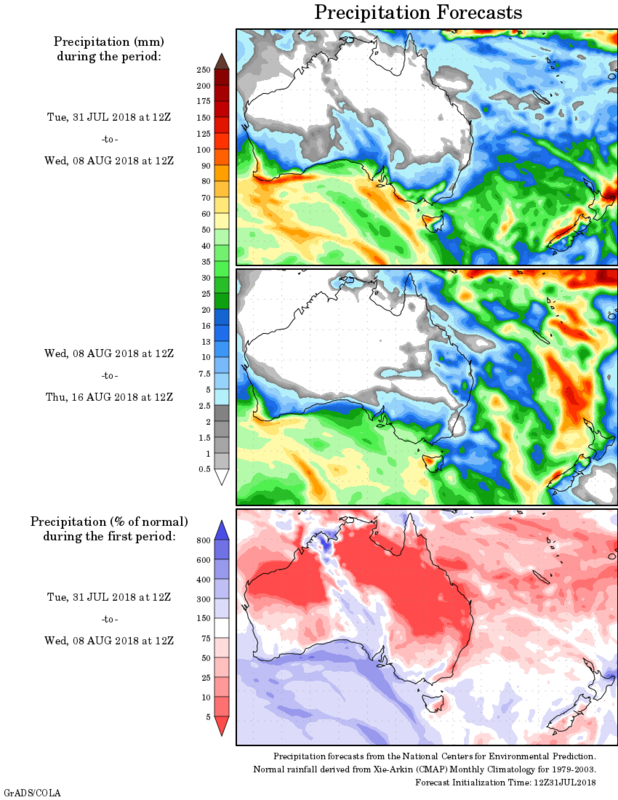 Rainfall deficiencies over 6 months have increased both in extent and severity for most of New South Wales, agricultural and east pastoral regions of South Australia, northern Victoria and southern coastal Western Australia. Long-term rainfall deficiencies are still present at 4-month and 7-month periods across much of New South Wales, southern and central Queensland, parts of eastern and southern South Australia, and southern and southwest Western Australia. Past seven days: At the start of the week, a cloudband associated with a cold front tracked over southeastern Australia, producing moderate falls across western Tasmania and widespread light falls to most of central and western Victoria, and southeastern South Australia. A thick cloudband and embedded thunderstorms associated with a significant cold front tracked across southwest Western Australia. The cloudband wrapped around a low pressure system located near the southwest coast, and produced widespread moderate falls about the southwest coast and adjacent inland and Goldfields districts. The cold front tracked eastwards across southeastern Western Australia and southwestern South Australia, with the associated cloudband and embedded thunderstorms producing moderate falls in West Coast and North West Pastoral districts of South Australia. In the east, showers and thunderstorms developed about the southeastern interior and central Queensland coast as a result of a surface trough, with moderate falls recorded. A westerly airflow over Tasmania brought moderate falls to western parts of the State, while a weak cold front brushed the southwest Western Australia and produced light falls in the middle of the week. In the last part of the week, a surface trough produced a band of middle level cloud across the interior of the eastern States, which spiralled into a low pressure system near southern central New South Wales. This system brought widespread light falls to central New South Wales and most of Victoria except the northwest and far east. The cold front tracked across the southeastern mainland and Tasmania, as a complex area of low pressure in the eastern Australian Bight tracked eastwards over Tasmania, and produced moderate falls in western Tasmania, and further light falls about southern and northeastern Victoria. Rainfall totals in excess of 100 mm were recorded in western Tasmania, including the highest weekly rainfall total of 193 mm at Mount Read. Rainfall totals exceeding 50 mm were recorded in far southwest Western Australia, and most of western and northern Tasmania. Rainfall totals between 10 mm and 50 mm in northern and western parts of the South West Land Division and southern Goldfields district in Western Australia; the South West and North West Pastoral districts, and southeastern South Australia; most of Victoria except the northwest and East Gippsland; most of Tasmania; in small areas of southeastern and the central inland of New South Wales, and in central and the southeastern interior of Queensland. Little or no rainfall was recorded in most of Western Australia except the southwestern quadrant, the Northern Territory, most of Queensland except the central coast and southeastern interior, most of New South Wales except through the central interior; and in northwestern and far east of Victoria.